Continuing positive US economic data into April, was assisted on Friday as the US earnings season kicked off in earnest, with the financial sector starting off with strong Q1 reports from J P Morgan and Wells Fargo. This has reinforced an already “risk on” environment and encouraged the major US equity averages to the upside, with both the S&P 500 and Nasdaq 100 hitting new 2019 highs. Furthermore, the major European equity indices also advanced, with the pan-European benchmark, the EURO STOXX 50 also hitting a new high for the year. The short- and intermediate-term outlooks for global equity averages sets up bullish into the earnings season. A firm advance Friday through the 3377 peak to a new cycle and 2019 high at 3382, to build on Thursday’s dip and a rebound from just below our 3339 support (from 3337), to restart the intermediate-term bull trend and to keep risks higher for Monday. We see an intermediate-term bull theme whilst above the bull gap at 3288-83. We see an upside bias for 3385/86; break here aims for 3399/3400, maybe towards 3412. But below 3361 aims for 3351 and maybe opens risk down towards 3339/37. 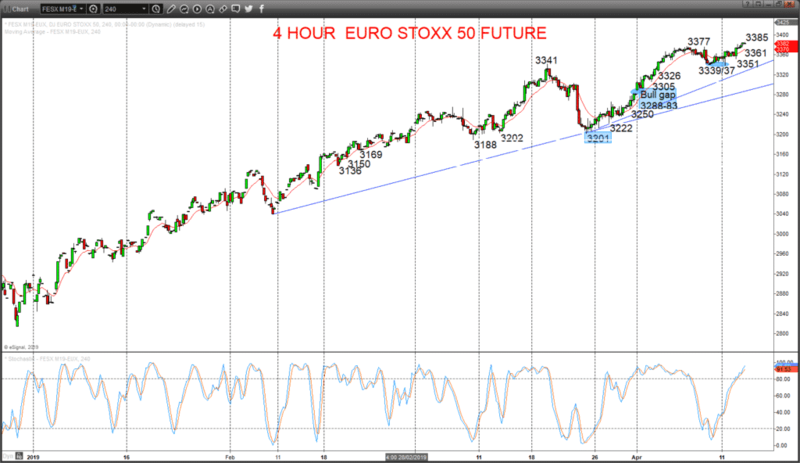 Intermediate-term Outlook – Upside Risks: We see an upside risk for 3412 and 3500. What Changes This? Below the bull gap at 3288-83 shifts the intermediate-term outlook to neutral and below 3201 to a bear trend. A surge Friday through the psychological/ option barrier at 2900.0, plus 2911.75 resistance, to reinforce the midweek bounce from above the firm 2862.25 support, off of our new 2877.25 level, to keep risks higher for Monday. 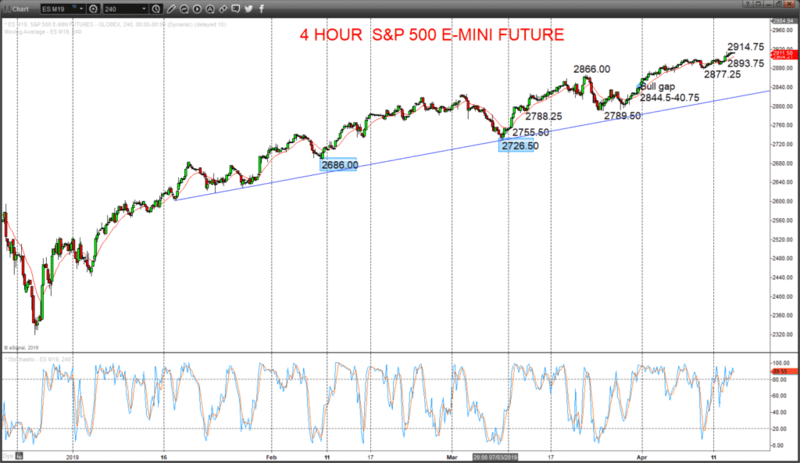 The late January push above 2690.5 shifted the intermediate-term outlook to bullish. We see an upside bias for the new cycle high at 2914.75; break here aims for 2924/25, maybe towards 2932.75. But below 2893.75 aims for 2877.25 and maybe opens risk to 2862.25. What Changes This? Below 2726.5 shifts the outlook back to neutral; through 2686.0 is needed for a bear theme.